Always wanted to learn to sail? Summer 2019 is the perfect time and Queen City Yacht Club is the perfect place. No experience is necessary, and you can learn at any age (participants range from age 18 to age 70)! Learn how to sail and enjoy one of the friendliest sailing clubs on the lake - all for one affordable price! The weeknight adult dinghy program is taught on Tuesdays and Thursdays from 6:00-9:00 over four weeks. The adult dinghy options are for anyone looking to learn how to sail by themselves and maybe even get their CANSail 1 certification! Enjoy summer by spending time on the water! A fun dinghy program for ages 18 - 80, learn the basics of sailing in theory and in practice! Course complies with CANSail standards and instructors are experienced and certified. Transportation to island on private QCYC tender is included with course fee. Includes an LTS pass which will allow access to QCYC for the 2019 season and some tender tickets to get you there! This course, which is internationally recognized by the Sail Canada standards, is designed to teach the beginner the necessary skills to act as both skipper and crew on a small dinghy. Participants will enjoy evenings on the water while learning all about sail theory, on-water safety, and practical sailing skills. Graduates of this course will receive CANSail 1 and/or CANSail 2 (Sail Canada certification). Small class sizes of 6-8 people will ensure that you learn as much as possible about sailing during the 8-lesson course. $ 620.00 for non-members and $ 555.00 for members - $ 65.00 discount for current QCYC members (plus HST) / session. Each course is 4 full days and courses are run in June and July. All participants will receive an LTS Pass which will allow access to the club for the balance of the 2019 season and some tender tickets to get you there! You will also have the opportunity to apply for a full membership at QCYC. The courses take place at Queen City Yacht Club from 9:15 to 16:00 on Saturdays and Sundays. This course, which is internationally recognized Sail Canada, is designed to teach the beginner the necessary skills to act as both skipper and crew on a boat 23 - 30 feet in length, in moderate weather conditions. The total length of the course is 24 hours, of which approximately 20 hours are on the water and the rest are spent on theory in a classroom setting. 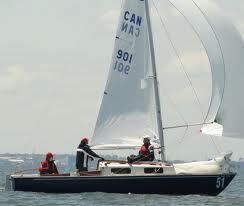 Graduates of this course will receive the Sail Canada, Basic Keelboat Cruising Standard. Check out our FAQs or email our Learn to Sail director, Robert Eckersley at: learntosail@qcyc.ca.